I find this a really lovely way of saying “don’t panic”, which I’ve always found dismissive and always makes me want to say something like “I’ll panic if I bloody well want to” or “WHAT IS YOUR OTHER PLAN.” When Debbi says “don’t panic early” I feel like she’s respecting my right to panic, isn’t taking anything from me, but wants to be sure that my timing is right, and I don’t waste any energy while we’re still in a phase that could have some solutions other than panicking. On Friday, I took a look at the blanket, and I took a look at the date, and I took a look at Megan and something happened. I panicked. Now, there is still some time to finish, I know that. I’ve got a few weeks I think, before there could be a baby, but I’m still on the last border pattern and after that there is another border pattern and then there is all the edging and… I felt sure that panicking was the right thing to do. I set about getting really hysterical about the whole thing, and then I channelled my inner Debbi, decided it wasn’t time, and set about knitting. That was my weekend. I’m happy to say it mostly panned out. I’m six rows from being finished that border, and then there’s just the second border and then there’s the edging and…. It was time to panic. I felt sure of it that time. I went on a search for my inner Debbi, couldn’t find her and called the actual Debbi instead. (Sometimes only the real thing works.) 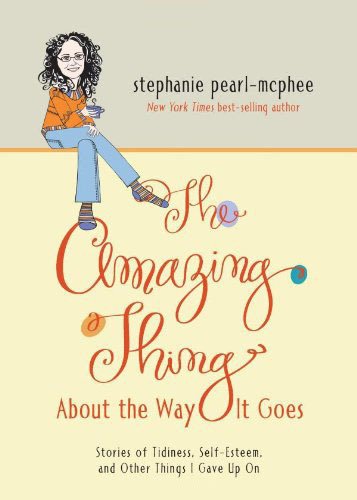 Debbi listened carefully while I explained what needed doing, and she looked carefully at the picture of Meg, and then she said something very real, and very accurate. I’m going to get right on it. There comes a time when you have to say, “This project has taken time enough” and finish it. All the best to Meg, but maybe we should hope she runs over with her baby baking time? How can you look at that sweet young woman and say that?! Better the blanket is late than Megan has to wait one second past when that baby want to make his entry. But you are the Yarn Harlot…..The blog knows you can do it.! Sometimes we also have to redefine “done” from our original vision. That explains a lot about my IT problems at work!!!! It will be fine. But I agree with Debbi, for what it’s worth, the blanket is WAY PAST big enough. And, my personal saying is the flip side of Debbi’s: You don’t want to peak too soon. We’ll, I would have been panicking ages ago but then I wouldn’t have signed up to do your project because….. we’ll, that blanket and I don’t exist in the same universe but you…… It never crossed my mind to panic because, it’s you. Don’t first babies always come past the due date? (Or at least we can all start thinking that so you can have more time… Meg probably wouldn’t appreciate that at this point). Otherwise, remember your grandson will love the blanket because he will know the love that went into it, whether it has one border or two or was ready when he was. Mine was three weeks early (the second one was only three days early). I think it’s usual for first ones to be late, but not always. More often than not, first babies tend to arrive late. My niece was born a little over a week past her due date. I, however, was really late. I was born a full two weeks after my due date, and as I’ve heard, the doctors actually had to induce labor on my mother to get me out. I can’t wait to see the blanket and its intended baby, though. Each of my babies was 10 days early – surprising everyone, including the doc who predicted another 2 weeks the day before #1 was born – so don’t jinx her by predicting a late baby! LOL! My grandbaby came 9 days early and this of course made her blanket late! I thought I had it in hand but I just couldn’t find more hours in the day you know because I lost whole days visiting(lol), luckily Steph knits faster than I do, I have witnessed it in her classes and I am sure if anyone can get it done in time she can, it might need to be take outdoor dinner for a little while. Knit like the wind Steph! Sorry that I laughed. :/ I didn’t mean to. I agree that keeping on keeping on is the way to go. Baby boy will arrive, and will it truly matter hugely if his blanket is not quite done? Or if it will matter, then end early, be done and happy, having only this border. Only you can know how this will go, and We Blog trust you. 🙂 We’re also watching anxiously to see what happens! You Got This. The baby will not come until the blanket is finished – don’t you have that kind of magic instilled in you? ha!!! : ) Funny as always, Presbytera! Ah! Thanks for that. I was going to ask for that bowl of popcorn to be passed around. I have got the red wine covered. Unwrapping the chocolate here. Popcorn hulls get under my partial. Pass the wine. 1600?!? Dear sweet Moses, that MUST be a typo? 1600 rows on a sideways edging means 800 stitches in the round. Friday, she posted 680 stitches to the round. The more rounds, though, (another border) means more stitches and twice that number of rows in the edging. Steph, the blanket will be done well before your grandson is capable of appreciating it so so not panic. Just knit, preferably quickly and for prolonged periods of time. This one made me really smile! Thanks. Wine helps wth panic, by the way! I’m saving that saying as I also have the early panic gene. Good luck! Grab a beer or two and knit for a couple of days. You will make good progress and won’t need to panic. But it might take some chocolate, too. I don’t know nothin’ about birthin’ no babies, Miss Harlot, but I think Megan is running out of waist, and you are running out of time. I’ve come here directly from Ravelry, and my finger actually moved to click your funny button! Excellent. I think more websites should be set up like Ravelry. I still wish Facebook had a dislike button. They’ve gotten close, but angry doesn’t always express how I feel. I seem to remember you saying on past occasions that the babies do not arrive until the blankies are finished – or do they not conform to that rule any more? Maybe Megan needs to have a wee chat with this little fellow and explain the rules to him so his gramma will be sane when he arrives? Atticus would tell his children “It’s not time to worry yet,” and they wouldn’t. I don’t have any doubt that you’ll get it done to your satisfaction, but I do suggest you’re worrying about the wrong thing. As was pointed out, you do possess powerful juju when it comes to babies not arriving until you finish the project, and I submit that it’s Megan you’d better worry about — she’s a sweet girl, but remember that look when she posed in the satin princess costume? I think you’re courting that when she figures out what’s keeping her pregnant. You do not want that look. Knit like the wind. No ski, no organize, no diversion, possibly no meetings. Knit like the wind. Yeah, I wouldn’t want to be on the receiving end of that look! Wine cork popping….pop corn popping….I need nothing else but time. As sadly, do you Steph. Make it work! You got this. I was as big or bigger than this at 36 weeks and went to 42, it can happen.. crossing my fingers for you. Megan is not there yet! Good luck with your Lacework. All our four kids were put into a puckering sack, I have knitted out of ecological wool with simple stripes. When I look at the photos every now and then I like the bright colours and the beautiful Babys in it! The Babys make the magic anyway! absolutely – the baby will come when the baby is ready, and the blanket will be done when the blanket is done, and it will be great! YES! The baby will be fine until the blanket is done. I promise!! Meg, have the baby. Your mother can finish the blanket while she watches the baby sleep so you can sleep!! Oh dear. I fear that panicking might have a bad influence on the knitting. Please remember to breathe! So when you say you’re on the last border pattern and then there’s another border pattern…should I be confused? Or is last really last and it’s edging time? You can also bind off and add to it as he grows. When Elliot is born, my local NICU will be getting a bunch of baby hats and booties (using your cutest booties pattern) donated to them to celebrate. I would also like to donate to PWA, as my funds are limited right now, i would like to donate whatever his birthweight is in dollars and cents (ie 8.25 pounds would be $8.25). Would Megan mind if you shared his birth weight when he is born? I think that is a wonderful “welcome to the world” baby gift! Didn’t that kid just get pregnant like 5 minutes ago? Where the hell have the last seven-to-nine months gone? More like weren’t the girls having that indoor water balloon fight just a couple of months ago…. time is flying! If you are radio silent for a while The Blog will understand. Now stop reading this and get back to the task at hand. I am with Debbi. Time to panic. Finish the border you are on, and hit that edging, with it’s thousands of rows. Maybe, that way, the blanket will be dry after blocking when the little guy arrives.Bonne chance! It looks as if Impending Grandson might be almost ready to make his grand entrance. Keep the coffee coming, Joe — Steph’s going to be pulling some all-nighters to get this blanket done in time! My version of don’t panic early is don’t preown trouble. (It’ll come on its own just fine and you can deal with it then.) The baby will come. There will be a blanket. The order in which those two things happen is the only thing at issue here, and whatever order they happen in, as long as they’re both true at the end of the day, it really will be OK. Pour a glass of wine, and remember that you’re doing this so that that baby will have that blanket for a long time, whether or not it’s there on the day he’s born (because you will be, and that’s what matters!). Nah, I say still too early. You and Megan got this. Don’t panic… just knit away, and enjoy, if you can. After all, the larger picture is that you are knitting a heritage blanket for your first grandchild. The time and love and care that you have put into planning and executing every stitch of this won’t dissipate, even if the baby arrives before the blanket is cast off. Right?! How totally, wonderfully, reassuringly, sympathetically, awesomely, humanly, perfect that your knitting is where it Should. Be. Now. Ahem. As is mine. I think we all need a Debbi in our lives. I hope to get to meet her someday. Sending lots of good blanket knitting energy your way. Fourth trimester. Babies aren’t really done until they’re​ three months old. You have 12 weeks more than you thought. Crimey!! Meg should be the one panicking now, not you two! But she looks perfectly calm and happy, as if she’s been through it a dozen times already! Good luck to both of you! I know that deep inside you know this but as a mother of three and a grandmother of two who made blankets for each of the grand babies, I’m going to say it anyway. That baby is not going to know or care if that blanket is ready when he makes his appearance. He and his parents are not going to love you less if you don’t finish by your (self imposed) deadline. Stop panicking and just help your lovely daughter enjoy these last weeks of her pregnancy. Everyone would much rather have a calm, relaxed you than a frazzled one. By the way, no, I don’t think I finished either blanket before the births and no one voted me out of the family. You’re going to be a wonderful grandmother whether or not you win the race with your grandson to the finish line. Just. Relax. There might not be a new baby today, but it looks like he will be here very soon. Good luck, Stephanie, I hope you finish in time. When I panic my hands shake and my stomach twists in painful knots and my mind goes blank… not a conducive state to accomplish anything, let alone lace knitting. But if panicking causes you to focus harder and get sh%t done… panic away. And best of luck to you and the Mom-to-Be!!! It’s not panic. It’s joyful anticipation that you’ll get to meet the newest member of your family soon, with just a small jolt of adrenalin on the side. Did you not design this blankie yourself? I believe that gives you the ability to determine when you want to call a halt to the proceedings and declare it finished. 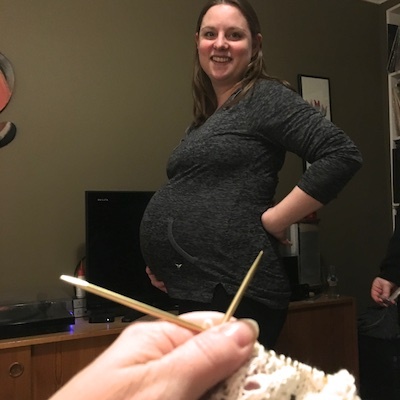 It is a baby, after all, he will not notice if there is one border or two; and it would be horribly bad manners for any knitter to comment on the lack of a second border. Non-knitters wouldn’t even notice. Fortunately it’s definitely too early to panic over what you’ll do if she goes into labor during your retreat. Knit very old one*! Knit like the wind! *You are not old. But you have to say the whole thing. Are you counting all the hours she will be in labor when calculating how much time you have left to knit? Mena of “Knitting Expat” just knit through most of her 20 hours of labor!! Although the blanket wouldn’t be seen in all its glory (except for what it’s bundling, of course)… lace needs to be wet blocked to display its full beauty. Megan does not yet have that, “Get it out NOW!” look. She’s still able to smile and doesn’t look exhausted. That said, get your fingers flying. The two of you sit down, put your feet up, give Meg some juice while you have wine, and knit knit knit. That said, my kiddo was 10 days late so you might have time. Time spent worrying is time wasted. Instead, spend time enjoying your family, the early signs of spring (if there are any in your area), and knitting CALMLY. My daughter always says “Don’t panic unnecessarily”. All 3 of my babies were early, the first by 3 weeks. Do a mock block, then decide. We have faith! First – Panic, Second – Gin! Good luck – it looks big enough to me, though. For Meg – Congratulations. You look beautiful. I think I can safely say on behalf of The Blog that we’re so happy for you and wish your mother would hurry up and finish that blanket so we can “meet” your new son. For Steph – I’d have to agree with others who’ve commented that Meg doesn’t have the “GET THIS KID OUT RIGHT NOW BECAUSE I AM FED UP WITH BEING PREGNANT” look that I’ve often seen on expectant mother’s nearing the finish line. I think you’re ok; Harlot-loved babies know they’re supposed to wait until their blanket is done. That’s the rule. You’re totally good. Unless of course Meg is just putting up a good front because she is a lovely young woman who doesn’t want her mother to panic. There’s also the outside possibility that your grandson is a rebel who will use the opportunity of his birth to show everyone that he has the courage, like his grandmother before him, to ignore the rules and make his entrance at the time of HIS choosing, full speed ahead, bring on the midwife, rules be damned. In which case, you may be screwed. But only in terms of finishing the blanket. Would someone please pass the nachos? Next time: “start early”, to quote a professor giving us advice when writeing research papers: “write early, and do the research with and while you are writeing”! There is always something to be changed, or you stuck with something… At least my knitting AND my research go often the same lane… Unfortunatly I got a Date to catch, and a lot of writeing to do until Summer! No knitting time for me. Megan go and SLEEP A LOT! Motherhood is a Synonym for LACK OF SLEEP. 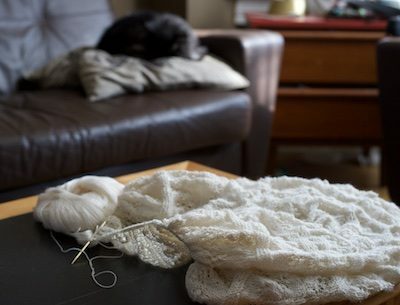 I knit very complicated lace shawls for my daughters and daughter-in-law’s weddings and although they were married at various times of the year, the temperatures hovered over 80F for all three. No one wore them! Don’t panic. Finish where you are and the edging as others have suggested. It will be gorgeous and appreciated by mom if not the grandson for many years. Did Debbi say 1600 ROWS? Stitches maybe? Anyway, I think your baby blankets are epically huge. As a person who hates to be dragging things on the floor or ground, I sometimes wonder how manageable, under everyday circumstances, they might be. You are not knitting a cover for the baby’s marriage bed, you’re knitting a baby blanket, and most likely it is big enough. Start the marriage bed cover after the birth. I imagine it’s a side-to-side edging, so it’s probably 1600 rows. Meg looks so serene and happy! That’s the most important thing even if you are the family knitter and baby-blanket maker. I think Debbi is right – the blanket is big enough, just do the edging and you’ll be on target. That baby will love you, and it, just as much. Much love to your whole family and this wonderful time! There will be plenty of time for that sweet baby to spit up and pee on that blanket, even if the blanket is the second to arrive! My mother has a blanket she started for her first grandson – she still has it and everytime there is a new baby she says she will finish it. Her grandson is 34 years old and has 2 daughters of his own now. Panic, finish that blanket. My niece is due around the same time as Megan and I have officially hit panic mode – sweaters need to be finished and put together, a blanket needs to be sewn, and a quilt needs to be done…. 3 weeks is enough, right? Whenever baby arrives will be the right time. Whenever the blanket gets finished will be the right time. There will be joy! I won’t mention that my firstborn (and only child) was almost three weeks early. No. No need for that. I just came to say, I get it. THIS blanket is for your first grandchild, and thus needs to be kinda epic. Contain everything and show aaaaall your love. erm. Steph – no need for that, you’ll be able to show him that in a million other ways as well. The baby won’t care if the blanket is late. In fact, no one will care because everyone will be focused on THE BABY. Remember: it’s only knitting, not life or death. First, Meg is beautiful. Gorgeous. i can’t wait to see both finished creations. Her firm grasp on reality is one of the many reasons that I love Debbi. Speaking of which, you do have a plan if the baby decides to make his arrival during the retreat, right? Right!? We all understand that grandbabies come before knitters. Congratulations again to Meg and hang in there, sleep while you can, the hard part is yet to come. That said, Dear Stephanie have faith the blanket will get done and the baby will arrive safe and healthy. The exact order of which is unimportant. Now that said– knit knit knit and do not stop until it is done. p.s. The blanket looks too complicated for my novice knitter brain. For a moment I thought “oh well this always happens,” but then it occurred to me — you have a retreat between now and baby!! There is no time for you to knit there, and I know because I have been to one. It might be time to downsize. Ugh, what an awful feeling. Breathe. Unless you run out of yarn. We believe in you, the blanket, and the baby! I felt for sure that this post was going to tell us Megan went into labor. Knit, Steph! KNIT! I think I have a defective panic gene… I wouldn’t get anything done if it weren’t for deadlines. This characteristic induces panic in everyone around me. Too bad we can’t average the panic genes between us… I’d do more, and you’d relax a bit as you finish this blanket. Kind of like averaging our heights between us, so we would each find it easier to get clothes that fit. Are you sure there’s just one in there? You may need another blanket. …. just kidding… well sort of . Meg does look well-encumbered. But very beautiful! I’m a panicker. I can’t help it. I suffered through some big traumas and have some residual anxiety issues from it, and if there is one thing I’ve got done to an art.. it’s how to panic. I never would have even started that beautiful blanket because I would have worried too much about all the things that could have gone wrong, not finishing in time, and that whoever I made it for wouldn’t love it as much as I did (I know right. Issues). Relax and focus. Panicking doesn’t make you knit any faster (and is likely to make you make a mistake) The most important thing is that the blanket is knit with love, and that’s clearly happening in spades. Whether you give the baby the blanket on day 1 or day 3 or day 10 doesn’t *really* matter. It will be his for life, and that’s what matters. ps- it looks beautiful! I can’t wait to see the finished product! Then keep knitting on the Real Blanket whenever you have a moment. You of all people know the function (as per Mary Cronk) of knitting during a birth! Much love and support to you and Megan and the whole family. Proxy could then be pocket square for grandboy’s future life events – e.g. confirmation, wedding….. Just saying. Sending best wishes to Meg, baby and all; you’ve got this, Steph. Repurposing Proxy Blanket as a pocket square – excellent idea! I have knitted Proxy Baby Sweaters which have also been used as Christmas tree ornaments. Baby hasn’t dropped yet, you’re good. My babies never dropped until minutes before labour began, so that is meaningless. Deep breaths. You can do this. But, maybe do it quickly, yeah? My only comment is that you can’t dry white laceweight blankets in the oven to speed up the process…so start panicking. I need to tell my boyfriend about “don’t panic early.” I’m the person who goes from (real example here), “My stummy hurts” to “OH MY GOD, I’M GOING TO WAKE UP DEAD TOMORROW” in about two minutes flat. You knit…we “The Blog” will panic for you! That way all your strength can go into the knitting. But, knit it until it feel right for you to be finished. If your grandson arrives before his blanket is cast off, no problem. He, and Meg, will still love it, because you made it. If anyone can do it YOU can!!! You have the Borg (oops, blog) and yarniverse routing for you!!! Oh, and its a wee baby…. maybe it doesn’t need a big blanket!!! Sending all my positive vibes your way! Aw, I love the look of a prego lady. That’s all. Finally!! We’ve been twitching our fingers to help you knit faster-all the while wondering why all the baby cribs in your family have king sized mattresses. That is a beautiful expression and I’m definitely going to use it. I think you should finish the blanket as planned. You will always, always regret it if you cut it short now and do not finish it to you wishes…speaking from experience here. Just keep on knitting! Dear Steph, the blanket will be finished, Meg will have her baby and everyone will enjoy the excitement. I believe in panicking early. It saves time later. In this case, it’s too late to panic. Calmly reassess, replan if needed, and then get on with it. If you must panic, consider panicking over the kid’s wedding shawl. I see….instead of panic, lots of late into the wee morning hours of knit, knit, coffee, knit, knit, coffee, sleep, up, coffee, knit. That is going to be me for a few weeks. I stayed up till after midnight knitting for a May deadline and I will stay up till it is done. Panic? Nah! You can do it. Go Steph, KNIT, KNIT, COFFEE!!!! One of the things I love about this, is I can actually hear Debbi saying that! Yeeks! “I’ll never finish in time.” That keeps going through my head. I have to crochet Han Solo and Princess Leia wedding cake toppers, requested by my daughter for her wedding! WE will understand if there is no blogging until the baby and blanket are “done”. Priorities, after all… Best to you all!! If it were me and I were 35 weeks pregnant (which I am) and my mother were knitting me a baby blanket that the babies famously tend to wait for (which she’s not), I would ask you to bloody please frigging panic already. But this is my second, and this is her first, and I think around this time last time I was pretty ready, but also nervous and feeling like my belly was a super safe and convenient place to keep a baby rather than outside in the world where things could HAPPEN to him. So, you know, I’m not Megan, but as a woman who is almost exactly as pregnant as your daughter, I say, pedal to the metal, woman! I just finished a pair of socks that took 20 + months to complete as I only knit when I travel and sort of misplaced the project for a season or two….dear Meg could have TWO babies in that time! I usually have separation anxiety + superstition over baby knits/gifts and don’t actually finish such projects until the babe is actually safely born. Re-think your plan…and panic is always healthy, too!